Congratulations! If you landed here, then you must be a proud owner of a chocolate fondue fountain. Once you use it, you will wonder why you didn’t get one long ago, and more importantly, what other occasions can you use it for. These beautiful flowing machines will have you jumping to keep trying out new recipes. Your chocolate fondue fountains can also be used for caramel and strawberry recipes. Don’t worry; operating your chocolate fondue fountain is easy to master. We want to help you along your way to success with your machine, so here are some very good pointers that will make the process easier. Most chocolate fountains work the same; however there are two different types. There is the pump style and the auger (corkscrew) driven chocolate fountains. If you have a pump style, be sure to watch to see if the small plastic tube is clogged. Auger style fountains will often do the same. The solution is to turn the auger off for about 10-15 seconds. The chocolate will go back down into the bowl from this tube and you will notice air bubbles popping from the chocolate. At this point, you can turn the machine back on. Always choose the set-up location carefully. Avoid near air conditioning ducts, swinging doors, dance floors, etc. Air conditioning ducts will cool your chocolate and harden it. Never use your chocolate fountain outdoors. You may be tempted, and in theory it is a pleasing idea, but the unexpected could suddenly happen such as a gust of wind, insects, or a storm. 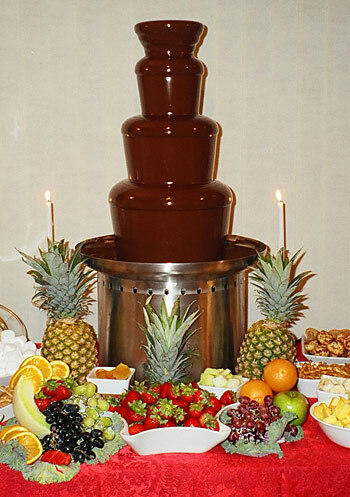 Always level your table after you set the chocolate fondue fountain up. Grab a 6-8 inch level and make certain the table is sturdy and exact. “Eyeing” the fountain is not accurate. Before you put the chocolate in the fountain, lay your level across the edge of the fountain’s bowl and adjust the feet of the fountain. Repeat with different edges around the bowl. Nothing looks worse than a off-set fountain. Your chocolate tiers will not look as good as they could. If you are using your fountain for an event and have to haul it, consider melting the chocolate before hand and then transporting in tubs inside a cooler. Chocolate will harden at a temperature of 70-72 degrees. Insulating it in a cooler will keep it smooth and ready until your event. Even if you are at home, the chocolate can be melted earlier and stored in a cooler until ready to use. Always preheat your chocolate fountain before you add your chocolate mix. When a room deviates in temperature, coldness will make the metal bowl and tiers cold. Your chocolate will begin to harden and not flow properly if this happens. Don’t forget to test your chocolate fondue fountain before you put the chocolate in to make sure the machine is working properly. Have plenty of paper towels, sponges, flexible plastic bowl scraper, and bowls for leftovers available. Wear an apron. Bring a hairdryer and an extension cord just in case you have to warm up the fountain’s components. You can also use a blow dryer to melt away any leftover hardened chocolate left in the fountain after your event is over. Hide the electric cord and out of people’s paths. Murphy’s Law guarantees somebody is likely to trip over an exposed cord, and could easily knock over the fountain. Chocolate is poison for dogs. Cats will want to play. Unsupervised children can be a handful. Drunken adults can be a handful. These areas you will have to watch while you are using the chocolate fountain. The best way to handle this is to assign someone to keep an eye on the fountain. This may prevent some late attempts to put heads under the fountain to drink the chocolate. The biggest thing about a chocolate fondue fountain is the clean—up. If your facility doesn’t offer a kitchen area, be sure to bring large plastic trash bags to the event for this purpose. An emptied fountain still will have a lot of chocolate in it. And, never leave chocolate in the fountain after you are done with the event. Hardened chocolate in the machine can burn out the motor. If there is some hardened chocolate in the fountain, turn on the heating element only. This will melt the chocolate. A blow dryer will work wonders on the tiers and tube.